Hi, Im Jo! 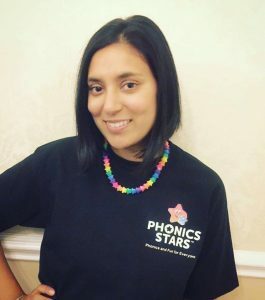 The licensed Phonics Stars ™ Leader for Bishops Stortford, Ware and The Hadhams. I’m a qualified primary school teacher and a mum to two cheeky little girls. Teaching has always been a passion of mine, but combining my full time job as a mum and going back into teaching (after having spent the best part of 10 years working with young children) was a challenge. I decided it was time to find something new! Having attended various mother and toddler groups, I began to research classes that I could get involved with – and this is when I discovered Phonics Stars™. The opportunity to be part of a franchise which shares the same ideas, values and beliefs about education as I do was a big driving force in pursuing my personal journey! Through Phonics Stars™ I am able to fulfil my passion for teaching as well as my desire to be a hands on mum. Watching children build their confidence as they uncover a world of new words and experiences, whilst supporting parents and carers with phonics is an absolute joy! And one which I really want to continue to spread through Phonics Stars™! Contact Jo via Email jo.patel@phonicsstars.co.uk or via her Facebook Page.